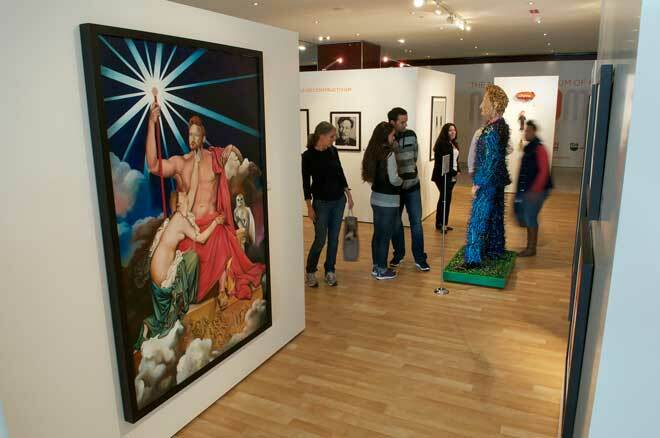 Visitors to the NY Coco MoCA exhibit stroll through a collection of Conan O'Brien fan art at the Time Warner Center on Monday. During the hullabaloo that led to Conan O’Brien leaving The Tonight Show, fervent fans rallied around the comedian. Some joined Facebook groups, others railed on Twitter and still more exhibited their love of O’Brien through art. Now the tallest ginger on late-night TV (probably) is happily ensconced at Conan on TBS. But that doesn’t mean there isn’t still an outlet for Team Coco artwork. Starting Monday, the New York Museum of Conan Art (aka NY Coco MoCA) is displaying more than 50 pieces of fan art created for the late-night TV star at the Time Warner Center in Manhattan’s Columbus Circle. The exhibit also features an original sculpture by artist Federico Uribe. The NY Coco MoCA exhibit will be on display until Nov. 3 and is open from 9 a.m. to 9 p.m. If you’re not in New York, you can check out a few samples of the geeky works on display in the gallery above.